Lava flows down the slopes of the Mayon volcano in the Philippines. 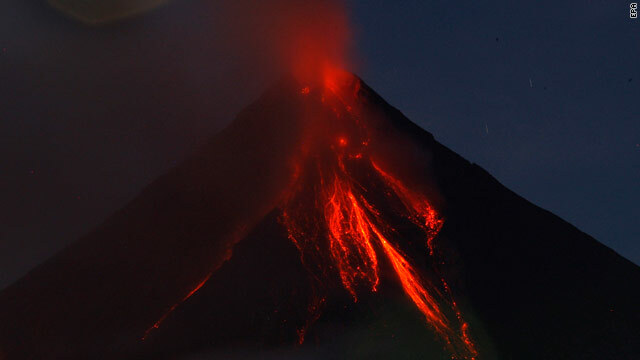 People in Albay province, about 466 kilometers (290 miles) south of the capital, Manila, flocked to town centers to catch a glimpse of glowing lava cascading down the slopes of Mayon. The volcanic mountain soars 2,464 meters (8,077 feet) into the sky and has erupted 49 times since the first documented eruption in 1616. Provincial Gov. Joey Salceda ordered mandatory evacuation for residents of 45 towns and cities within a radius of 6 kilometers (3.7 miles) around Mayon, including Legazpi, Ligao, Tabaco, Daraga, Camalig, Guinobatan, Malilipot and Santo Domingo.